Stop dangerous slips on carpeted stairs with No-Slip Strip Carpet Stair Treads. Easy to install and remove, these durable carpet stair treads come in a variety of textures, lengths and colors to meet your traction requirements and blend in with your interior design. A durable aluminum base-strip, retaining screws, and traction tape to match your decor are included in each package ordered. Tested and approved by the National Floor Safety Institute (NFSI) and/or exceeds safety standards established by the Americans with Disabilities Act (ADA) and the Occupational Safety and Health Administration (OSHA). 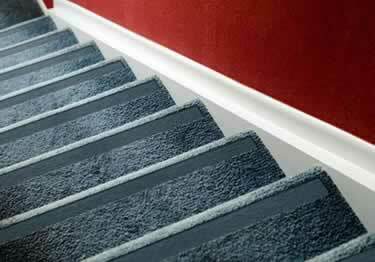 The Comfort Grip Strip is the most popular of the No-Slip Carpet Stair Treads. It is very comfortable to walk on yet provides a higher level of traction than the Standard Grip Strip. Super Grip provides the highest level of traction among the No-Slip Carpet Strips. This serious traction protection is not recommended for stairs used by toddlers and may cause snags in socks/stockings. How to Order Measure the right length: Measure the length of each step (longest side, left to right) and subtract two inches. The result should be the maximum length to order. So if your step measure at 33 inches in length, then subtract two inches and order the 31 inches precut length. It is okay to order a smaller length and it is recommended not exceeding your maximum calculated length. Step 1. Place the base-strip about 1.5' from edge of step. Indicator on base-strip shows you which side must face the front of step. Step 2. Set power screwdriver to 16Nm and install retaining screws. Step 3. Apply peel-n-stick traction tape on top of secured base-strip. Please confirm if only 1 strip comes in each order of the 31 inch comfort grip strip. Thank you. Stop those dangerous slips on your carpeted stairs with No-Slip Strip Carpet Stair Treads. Available in Comfort and Super Grip traction levels, 21 standard lengths and 23 colors to meet match your decor. Looks good and seems like it should make the carpeted stairs more safe.